1. Preheat the oven to 200°C, gas mark 6. Spray a large saucepan with oil and cook the leeks and chicken for 5 minutes until the leeks are softened and the chicken golden. 2. Add the stock and milk, bring to a simmer and cook for 10 minutes until the chicken is cooked through with no pink meat. Add the sauce flour to the pan, bring to the boil and cook for 1-2 minutes, stirring until smooth and thickened. 3. 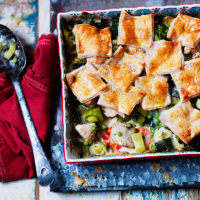 Stir in the peas, broccoli and soft cheese, then tip into an ovenproof pie dish. Sit the dish on a baking sheet. 4. Cut the pastry into 12 squares and arrange on top of the filling – the pastry should overlap a little in places but not cover the filling completely. Brush the pastry squares with milk and bake for 25-30 minutes until the pastry is golden and the filling is piping hot.